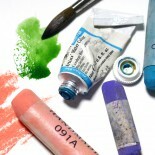 Wednesday Studio watercolorist Tara Hamilton contributed to this post. Peaches were plentiful at the Lunch and Learn Workshop led by seven Wednesday Studio pastelists at Iona Senior Center, host of the group’s current art exhibit. But not in the way you’d think. They appeared only after the pastelists and Iona’s guests had finished enjoying a box lunch together. Before the Lunch and Learn event, each pastelist did a drawing from this photo. The artists showed their work to the guests before they started their drawings, to show the uniqueness of each person’s way of creating art. When the meal was over, the art began. Patricia Dubroof, director of Iona’s art gallery, warmed up the group’s creative energy. To inspire the guests in their drawing, the pastelists went around to the tables to give them a close-up look at their pastel drawings based on the same photo the guests would be using as a model – a luscious-looking peach. Then the guests all tried their hand at their own peach drawing, encouraged by the artists. Although the peaches were only drawn on paper and varied a lot in style, color and technique, the drawings by both the artists and the guests left many mouths watering for the real thing. Wednesday Studio pastel artists Pat Stocks (standing, center) and Vince Iannochione (standing, right) show their peach drawings to lunch guests before the guests begin their own drawings from the same photo used by the Wednesday Studio artists. Before lunch, Ellen Cornett, current Wednesday Studio teacher, talked to the group about the history of the group now known as The Wednesday Studio, and Ms. Dubroof led a tour of the exhibit. Each pastelist had a chance to speak briefly about one of her or his paintings on exhibit. Kudos and thanks from the pastelists to Ellen for creating a concept for this workshop that gave all seven artists a chance to engage with the guests in the process of creating art, making it a fruitful experience all around. Ellen Cornett, current teaching artist for The Wednesday Studio (standing, at far right), speaks to Lunch & Learn guests about the history of the group, which has been ongoing since the mid-1990s, when watercolorist Gina Clapp started a Wednesday morning class in watercolor at the Capitol Hill Arts Workshop. Some current members were early enrollees and others also studied with Gina for many years. Ellen highlighted three examples of Gina’s beautiful watercolor work on the wall behind her. There’ll be another Lunch & Learn at Iona on Wednesday, October 11 from 12:30 – 2 p.m. with the Wednesday Studio’s watercolor artists. It will be an opportunity to come see the art, meet the artists and try your hand at watercolor. All ages are welcome! There is also a reception at Iona on Friday, October 13 at 5 – 7 p.m. RSVP for either one or both by contacting Patricia Dubroof at 202-895-9407 or pdubrhoof@iona.org; or by going to www.iona.org/arts and clicking on your event under “Upcoming Events.” Iona is at 4125 Albemarle Street NW, in Washington, DC. You can also see the part of the exhibit on display in Iona’s public areas by visiting the building during regular business hours, Monday – Friday, 9 a.m. – 5 p.m.
Much of the art is available for purchase, as are copies of books illustrated with their art that some of our artists have published. Wish I could have been there! The pastels everyone did of the peach are just amazing! This entry was posted on September 22, 2017 by eileenings in Drawing, Exhibitions, Pastel, Residency, Uncategorized and tagged Anne Shields, Eileen Leahy, Ellen Cornett, Fran Tomlinson, Gina Clapp, Linda Andreatta, Martha Pope, Pat Stocks, Vince Iannocchione.